How do I add banner images to a blog post, event, or user profile in the Canvas Community? Images are a great way to grab attention. Learn how to add banner images to blog posts, events, and user profiles. 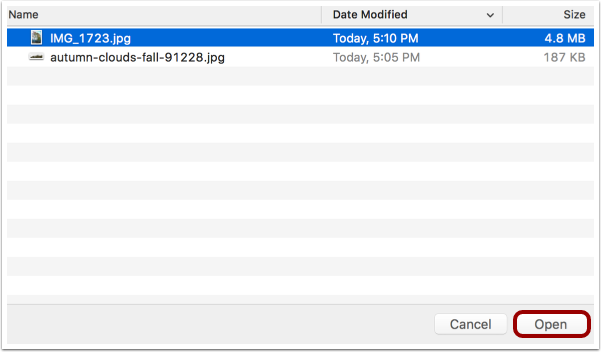 After you've determined the image you'd like to use, you'll need to crop it to the optimal dimensions of 1280px (width) by 400px (height). Fotor is a great tool you can use to crop images online without requiring a more powerful, complex app like Photoshop or the similar free/open source editor, GIMP. Here's a video to show you how to crop a high res photo using Fotor: Direct Video Link: Blog and Event Banner Specifications for Jive - YouTube. In your blog, event, or user profile, click the Add a banner image link . Click the Choose File button . Make sure your image is cropped to a dimension ratio of 1280x400 pixels. You can leave the background position as Centered or you can choose Top Center or Bottom Center . Previous Topic:How do I create a blog post in the Canvas Community? Next Topic:What is the Canvas Community Reward System? 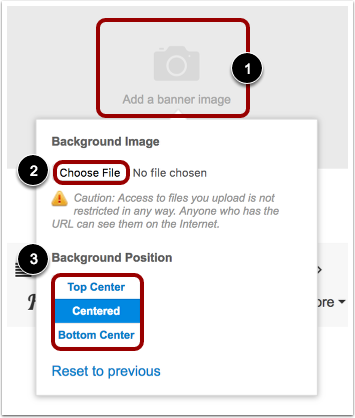 Table of Contents > Create Content > How do I add banner images to a blog post, event, or user profile in the Canvas Community?